Experience Photography With Your Phone Like Never Before! Even if your smartphone has a good camera with many features, it definitely doesn't offer you the possibilities of the ALAM camera lens kit! Apart from the 3 lenses, you will also receive a lens clip, a protective case and a manual to help you get the most out of your camera lens kit! Here's Why You Need The ALAM Cameral Lens Kit! The fisheye lens of the phone camera kit is going to allow you to take professional rounded images. With the wide angle lens you can photograph the most breathtaking landscapes, as well as take group pictures with your friends! Finally, the macro lens will allow you to take detailed and clear pictures, even when you zoom in! 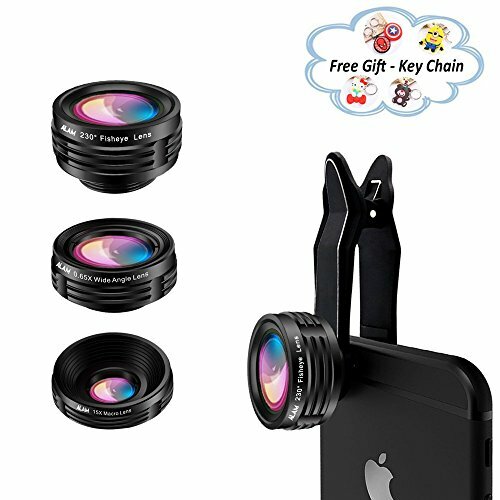 Get This Amazing Phone Lens Kit For You Or A Friend! Made with durable and sleek aluminum and the highest quality glass, these smartphone lenses will never fail to capture a moment in HD! So if you love taking pictures with your phone (or if you have a friend who loves photography) get this camera lens kit today! Click The "Add to Cart" Button NOW & Never Miss A Photo Opportunity Again!  TAKE PHOTOS LIKE A PROFESSIONAL: You don't need a large, professional camera in order to take amazing photos. This cell phone camera lens kit with the convex fisheye lens allows you to capture any moment with a fish eye effect. Try it out and see the amazing results! Our lenses are made of HD Glass as compared to others made of acrylic.  UPGRADE YOUR PHONE CAMERA: Thanks to this 230 ° wide angle smartphone lens, you will now be able to photograph beautiful landscapes effortlessly. You can also take group photos with your friends, and you won't have to huddle to fit into the picture! TAKE SUPER DETAILED PICTURES: Zoom in and take close ups of people, places and objects without sacrificing the quality of your picture. The ALAM 15x high definition phone macro lens, your photographs will be super detailed and clearer than ever! COMPATIBLE WITH ALL SMARTPHONES: This camera lens kit is compatible with all smartphone devices, including iPhone X, 7 Plus, 7, 6s, 6s Plus, 6, 6 Plus, As well as Android phones like Samsung Galaxy S8+, S8, S7, and S7 Edge, LG, Huawei, HTC and more. You can also attach the fisheye lens, macro lens or wide eye lens to your iPad and other tablets. A COMPLETE KIT FOR PHOTOGRAPHY LOVERS: The ALAM cell phone lens kit includes a fisheye phone camera lens, a wide-angle lens, a macro lens, a secure lens clip, a luxury protective carrying case, a soft cleaning cloth, and a comprehensive user guide. How could you say no to all these? If you have any questions about this product by ALAM Superior Lens, contact us by completing and submitting the form below. If you are looking for a specif part number, please include it with your message. Pixel 2 Case with Wide Lens Kit || Moment Walnut Wood Photo Case plus Wide Lens || Best google wide attachment lens with thin protective case.